Muddy feet are breeding grounds for nail fungus. Nobody wants to see his or her dog in pain, but sometimes it can be difficult to tell when something's bothering them, like when they're suffering from the symptoms of dog nail fungus. Learn about what causes this fungal infection and how it's treated. What Causes Dog Nail Fungus? Nail fungus in dogs can be caused by a variety of things. In the Midwest for example, dogs can be exposed to a microorganism called Blastomyces dermatitidis. These fungal spores exist around lakes and streams, and a dog can become infected after inhaling the spores. Like most forms of fungus, the symptoms of dog nail fungus can blossom when a dog's paws are constantly wet or damp. This is most common in dogs that are left outside for long periods of time or dogs that live in outdoor doghouses. Diet and hygiene also play a large role in the development or prevention of nail fungus in dogs. If a dog is fed a nutritionally poor diet, it simply isn't getting the nutrients it needs to fight off diseases and infections. Owners who don't trim their dog's nails or don't trim the hair away from them are also adding to the potential for their dog to develop a nail fungus because the long hair around the nails makes it difficult to keep the area dry. The symptoms of nail fungus can be difficult to identify for most pet owners because there are rarely any physical signs that the dog's nails may be infected. The primary behavior to look for is constant licking or chewing at the paws. Dogs have a natural tendency to lick or chew affected areas to try to calm the itching that's caused by the infection. In some cases of fungal infections, the dog's nails may become brittle or discolored, but even then, that's not always a positive indicator of an infection. If you notice your dog is chewing or licking his paws or you see that his nails have changed in appearance since you last trimmed them, have a veterinarian take a look. The vet will take a sample of the nail and place it under a microscope to rule out or confirm a fungal infection. Veterinarians usually prescribe a topical anti-fungal cream for treating the dog's nail fungus or, if the infection is severe, an oral antifungal medication may be prescribed as well. The biggest challenge with applying the cream to the nails is making sure it stays on long enough to do its job. If your dog can't control his licking habits, an Elizabethan collar will be required. This is the large, cone-shaped collar that's placed around the head of the dog to prevent it from licking the affected areas. Many dog owners take the health and welfare of their dogs for granted. They believe that the dog was naturally meant to roam the outdoors, so there's nothing they need to do to help their dog stay healthy other than feed it a balanced diet. This couldn't be further from the truth. Dogs are just as easily prone to infections as humans. Give your dog a clean, dry living environment. Feed your dog a nutritional, balanced diet. Bathe your dog on a routine basis. 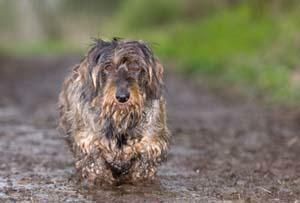 Rinse and dry the dog's pads if they've been in standing water or muddy soil. Make routine visits to your veterinarian. Your dog is one of your best friends and a cherished member of your family. You don't want to see him suffer from an infection that can easily be prevented. Follow these tips and you'll be doing everything you can to keep your dog happy and healthy.